The aim of this meeting is to introduce the theory of quantum groups and their representations, and to investigate associated 3-dimensional topological quantum field theories (TQFTs). We will investigate the braided tensor structure of the representation category of a quantum group and the modularity property of the semisimple quotient, when the quantum parameter q is a root of unity. We will then discuss the Reshetikhin-Turaev construction of a 3-dimensional TQFT from a modular category. Finally, we will describe the modern, higher-categorical perspective on TQFTs that includes not only invariants of 2- and 3-manifolds but also algebraic data associated to manifolds of every codimension. The lectures will include appropriate background material and are intended to be as self-contained as possible. 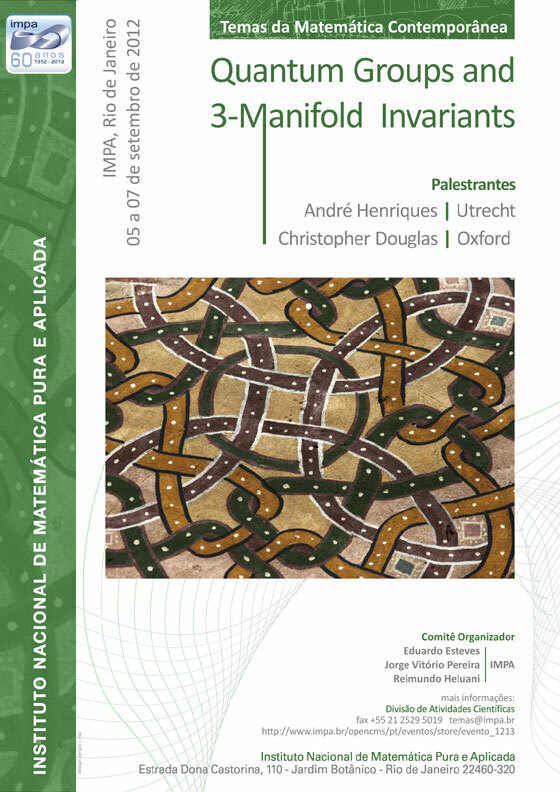 É uma iniciativa do IMPA destinada a expor a comunidade matemática nacional a desenvolvimentos recentes em linhas de pesquisa relacionadas àquelas existentes no Brasil. O formato consiste em palestras realizadas por pesquisadores convidados concentradas em um curto período, não ultrapassando uma semana. Elas permitirão à audiência adquirir uma visão sólida e coloca-lá a par de técnicas relevantes ao tema.